The Yoga of Eating seeks to undo the “war against nature” in its interior dimension. 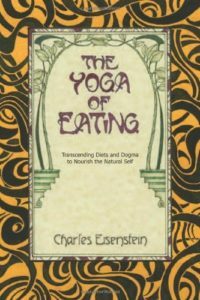 The topic of my first published book, The Yoga of Eating, might seem very different from those of civilization, money, crisis, and transition that I explore in my other writing. There is a deep kinship nonetheless: The Yoga of Eating seeks to undo the “war against nature” in its interior dimension. It therefore advocates deep self-trust and explains how to recover authentic appetite, so that desire and willpower, health and pleasure, no longer need to be opposed. You can order this book on Amazon, Indiebound, or better yet, at your local independent bookstore (if you have one). Enjoy! The chapter "The Illness Seeks the Medicine" has been translated into German.